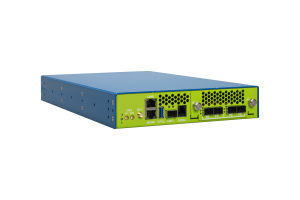 The ATLAS-1000 is a fully integrated, 1U application acceleration platform exclusively designed for OEM customers developing network/cyber security and monitoring appliances. The platform integrates Accolade’s APP (Advanced Packet Processor) in the form of an onboard FPGA with acceleration features such as lossless packet capture, nanosecond precision timestamping, packet merging, packet filtering, flow classification, packet steering and more. The API implemented for the ATLAS-1000 is also common to Accolade’s ANIC packet capture adapters ensuring seamless migration across Accolade’s comprehensive product offerings. The diagram depicts the architecture of the platform. The network interfaces are designed modularly as pluggable interface modules (PIM) that are interchangeable. Both 10G and 40G are supported along with options for an integrated optical TAP or optical bypass. All network traffic enters the APP (an FPGA) for packet processing. 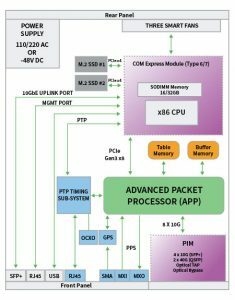 Packet data is then selectively forwarded (based upon application policy) to the COM Express module which houses an x86 CPU and associated DRAM. The customer’s security or networking application runs within this CPU complex. Although the platform is primarily designed to be a packet in, packet out device there is 1 terabyte of persistent SSD memory onboard that can be utilized to store and retrieve data. The ATLAS-1000 is a versatile, scalable and flexible platform that can be used in a variety of different applications. The diagrams below illustrate some of the many use cases for the ATLAS-1000 platform. The platform can be adapted to most any networking or security application. It is particularly interesting for inline (or bump-in-the-wire) applications, in which the APP is programmed to perform specialized packet processing (encryption/decryption, parsing, filtering etc) at line rate.